She sounded like she was twenty but I did the math; she couldn't be. Her dad was 95 years old! But, I couldn't get to him without first going through her. And really, it's just as well. I don't like poking around in family memories without at least one of "the kids" knowing about it. Thankfully, I've managed to catch the man when he's talkative as this blog post is only a fraction of what my notebook contains. Have a look at the airplane above. 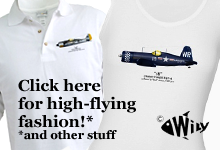 It’s an F4F-4 Wildcat from sometime in Spring of 1943. It flew from the island of Faleolo within the island chain of American Samoa. In case you were sick when your geography class studied obscure American Territories, Faleolo pokes up from the bottom of the Pacific Ocean about 2,000 miles north, northwest of Auckland, New Zealand. Faleolo is somewhere in that circle. I think. According to the internet gods, Faleolo is only one of 5 islands that total 80 square miles—about the size of Des Moines, Iowa. Today, its main business is tuna fish. But back in 1943, it was a place where tired Marine pilots went to rest. One of whom, was Sam Folsom, the young woman in the opening paragraph's father. "Popeye" was her dad's F4F. There are a few things you should know about “his” airplane. For one, it likely didn’t see combat. 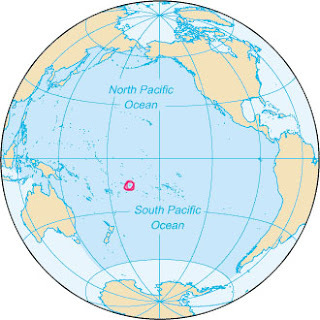 American Samoa was just outside the fringe of where the Americans and the Japanese clashed, hence its value as a place of "R & R". The fighters were there to help keep their pilot’s proficiency without the distracting pressures of combat. 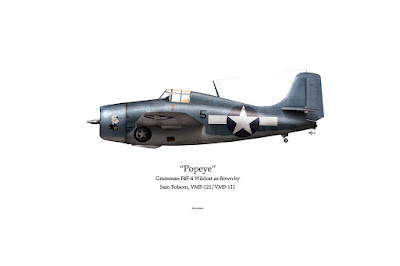 For two, the nose art—Popeye—is in Marine dress-blues. Though I had a pretty-awesome photo as reference, the pressure to depict the rendering accurately was exceptional in that I knew Sam would have an especially critical eye. He painted it himself. Sam the artist! This is Sam next to "Popeye." Courtesy Sam Folsom. For three, the insignia is a little odd; the white bar that seems to pass through the fuselage’s white star and blue circle does not have the typical blue outline and the proportions are atypical. But, it's about spot-on for the Faleolo-based airplanes. 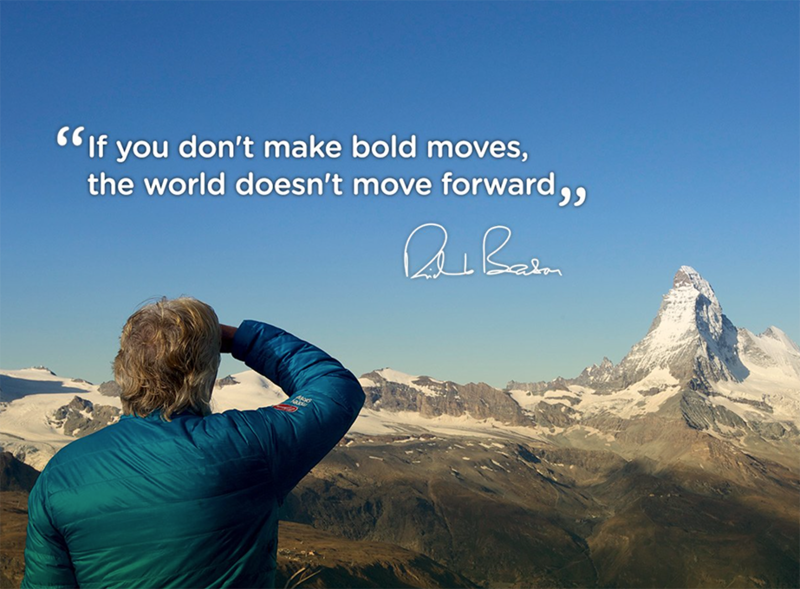 Modelers and detail wonks take note. However, draw your attention to the three stacked Japanese victory symbols under the cockpit. Those were achieved several months prior over Guadalcanal while Sam was part of the famous, “Cactus Air Force." 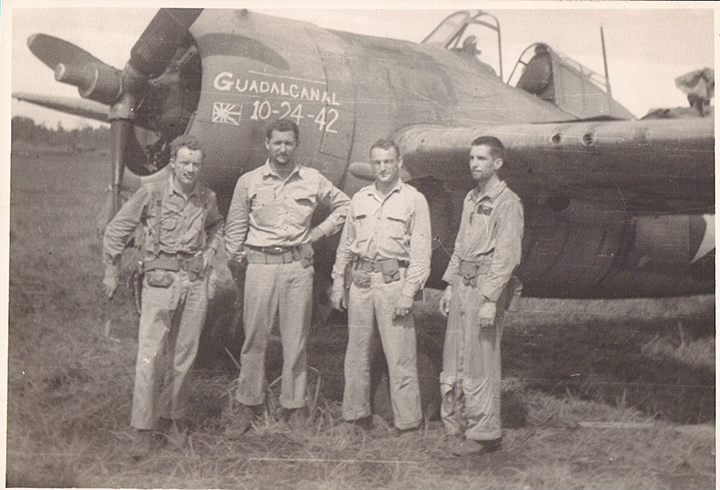 These were the Marine aviators that engaged the Japanese in the lore-filled street-fight for the island chain. Compared to London, Berlin or Pearl Harbor, Guadalcanal was a ridiculous place to stage a showdown. For most people, the term “Tropical Island” evokes scenes from an idyllic vacation. For the Marines of 1942, the picture was one of heat, infestation, dirt and death. The Japs were on the forward-move, needing the chain of islands (called The Solomons) in order to base their invasion of Australia. In particular, the single island of Guadalcanal was their choice for an air base in which to launch aerial attack. In a bold move to stop the Japanese strategy, American Marines landed on Guadalcanal on August 7, 1942 (just 9 months after the Japanese attack on Pearl Harbor) and after numerous back-and-forth battles, managed a claw-hold on a Japanese-built airfield named “Lunga Point.” Though the field remained under enemy fire for many more months, the Marines renamed it Henderson Field in honor of Lofton Henderson, a Marine SBD Dauntless pilot who was killed a two months prior at the Battle of Midway. Funny how quickly heroes can get memorialized, eh? 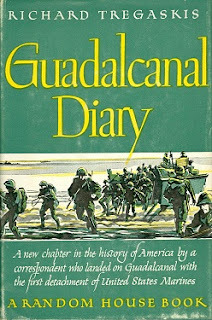 Published in January of 1943, and written by a young battle reporter, this book was fresh! It's definitely a great read; click here. Anyway all-things-Guadalcanal is the stuff of WWII Legend. I won’t even try describing it further. Sam arrived during the thick of it—8 October. At the time, he was one of the first echelon of seventeen Marine fighter pilots of Marines Fighter Squadron, VMF-121, tasked with defending the island. Sam’s recollections are not only unusually clear, they’re typical. Based on what I've learned from other Cactus Air Force veterans, there was no let-up on the pressure to perform. Japanese artillery hammered the base with jealous fury. Japanese aircraft strafed the field with sneering surprise and somewhere, out beyond the perimeter, Japanese soldiers sniped with an unnerving regularity that never allowed anyone to relax. This didn’t go on for hours or days. It went on for months. "It was hard time. We were in constant readiness. 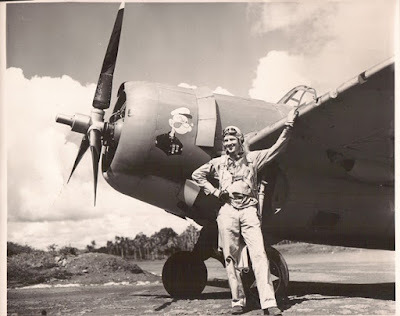 When I think back…’ (Sam’s voice trails, he clears his throat) ‘I believe (VMF-121) had 40 pilots in total. 20 of us made it out alive; 3 couldn’t cut it and were cleared out…(Sam’s voice trails again, he coughs). 16, 17 of us made it home. That’s not very many is it.” He states matter of factly. “That’s less than fifty percent.” I reply. Sam and Company, circa 1942. Sam is on the far left. However, don't miss stained patina of the F4F...and also, make sure you note the roughly hewn ramp allocated to the Wildcat drivers of Henderson Field. Ok. Pause for a second. Get this into your mind—a Kongo-class Battleship was equipped with at least 124 anti-aircraft guns. The six Destroyers (probably Fubuki-class but who the heck knows?!) would field another 180+ guns. All together Altogether, 300 guns firing an average of 400 rounds per minute put up 2,000 rounds a second. Now, think about this—2,000 supersonic pieces of metal, forming a lethal screen designed to stop the Americans from reaching the prize of real Japanese meat. 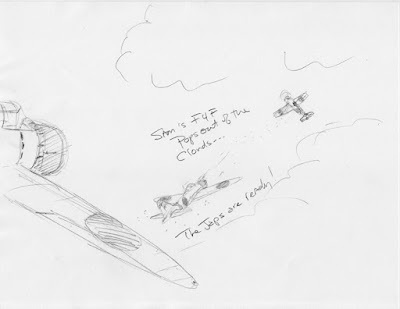 Fortunately, there was a cloud cap above the scene and Sam slipped into the milky gray just in time—just in time to catch a glimpse of one of the pursuing Zeros wing by so close, he could see the pilot. Sam breathed a sigh of relief; he’d made it. But not for more than a minute or so—an instant later, his tubby, blue-gray, bullet-riddled fighter pierced the cloud bank and re-entered the wide-open sky. Using their superior maneuverability, the Japanese were able to turn like flies and snap into firing position. Tracers stitched the air, some finding their mark, puncturing the thin skin of Sam’s airplane. And body. He turned again into the cloud. “What happened then? !” I exclaimed. Ha! Great excuse to doodle a dogfight. And there are more where this one came from, too. Sam then described limping home to Guadalcanal and landing his bullet- riddled airplane in a plume of black smoke and belches of flame. All things considered, I had expected Sam to show dramatic emotion in the retelling but he didn't. He stated the events so matter-of-factly, it seemed...routine. Stop. What a minute...the next day?! I need to stop here because if I don’t, I’ll end up writing for a year. It’s almost always this way—you try to figure out where a guy’s story starts and end up realizing that it’s much bigger than just a squares on a calendar. If you think I'm being cruel by pausing now, recognize that I simply have to as the man's life isn't organized into neat chapters. Instead, the days are linked in graduated hand-offs that link the last days of WWII in Okinawa, a gut-wrenching ring-side view of the Battle of Chosin Reservoir, a man-hug from LBJ, running errands for Juan Trippe and now, at 95, watching traffic from the insulated hush of a high-rise apartment. It's an old interviewer's trick; throw out a little controversy in order to spur conversation. I don't do this for sport but out of the sincerity that, if the hearer has something decent to say, the answers often help me define how I answer the questions myself. “Of what? !” He snapped. I wasn't sure if he was perturbed at my question. After a deep breath, Sam responded in the questioning tone that marks a man searching for the right words. “Any talk that we’ve taken so much, that we’re under such and such threats, (that) we can’t take any more…Christ. I’m in a luxury apartment, watching all the cars, the mountains (looking outside the window)…Baloney." Then, with a youthful burst, he found what he'd been trying to say was passing by, just on the horizon. Sam took another moment and stated thoughtfully, “Stress? That’s for newspapers." It's a quote from entrepreneur Richard Branson. I suspect Sam agrees. By now, I'd learned the rhythm of all-things-Sam Folsom. This wasn't a man who valued hand-wringing, fear or any kind of nervous self-preservation. It was full-bore into tomorrow or nothing at all. PS. I almost forgot. About Conan O’Brien. In 1998, Sam was at a bank that was being robbed. Long-story short, Sam signaled over to a cop on the street and helped him wrestle the robber to the ground. The story made national news and culminated with Sam’s appearance on Conan’s show. I’m working to get a clip of that episode but suffice it to say, in case you’re wondering where an “old man” gets the verve to stop an armed bank robber (shots were fired, btw), it may have a start but usually, it's a just a momentary expression of an entire lifestyle. This is Sam circa 2015. 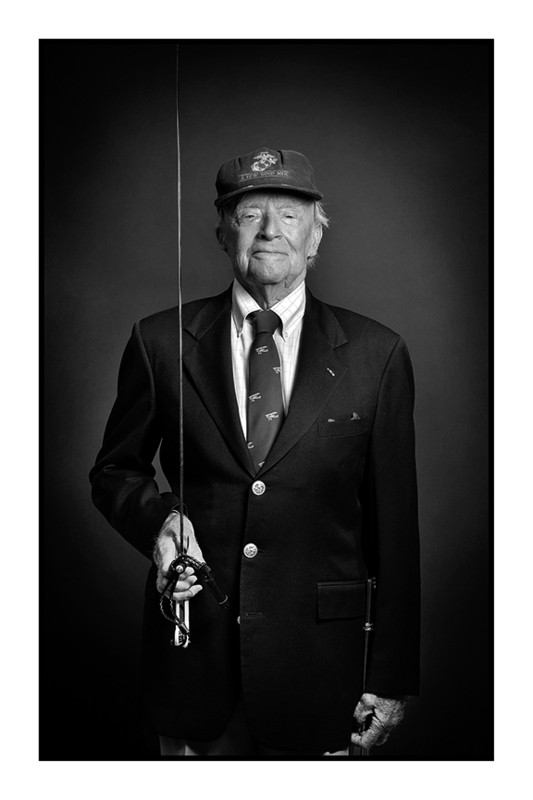 The photo was taken by photographer Ed Burns. To own a print of "Popeye" (signed by Sam) click here.